We all know the “traditional” tale of Pinocchio: the wooden puppet who just wanted to be a real boy. Created as a grim Italian children’s novel by Collodi, and sanitised for the Disney movie, emerging theatre company A_tistic have cleverly re-imagined this story as part of the 2016 Melbourne Fringe Festival in quite a different way and with some brilliant results. A_tistic aim to tell stories that highlight the experiences and create an understanding of autism spectrum disorders, so writer and director Tom Middleditch has adapted Pinocchio’s tale as an allegory for a boy with autism who is attempting to become a "real boy". Middleditch, himself on the autism spectrum, has created a thoughtful story that not only looks at the anxieties and difficulties people with autism can experience but also those of their parents attempting to understand and accept their child as they are. Matt Alden as Pinocchio is very comfortable with the character and material, and his mannerisms and body language do well in conveying the thoughts and feelings a person with autism can have. The visual cues of how someone with autism processes information is done simply yet highly effective, such as when the ‘running puppet’ is deciding upon his name. 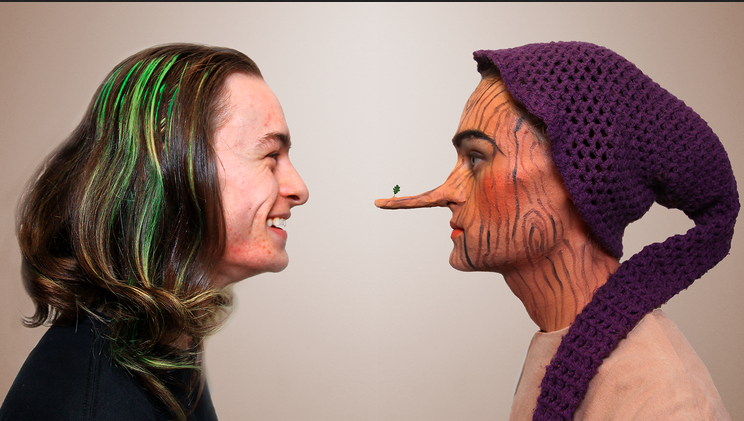 Similarly, Edan Goodall and Sam Barson are entertaining to watch as Gepetto and Crichton, particularly the former as he tries to find a way to build a relationship with Pinocchio. The naturalistic costuming that highlights the personalities of these characters is well thought-out, however I feel some subtle creative touches could have benefited the characters of the Blue Fairy (Sophie Jevons) and Fox (Kristiane Burri). The same can be said about the set design and its painted cardboard backdrops. However, due to Middleditch’s strong engaging narrative, the weaker design actually supports the play by allowing our focus to easily remain on the characters without any of our attention wavering. With Pinocchio Restrung, A_tistic accomplish exactly what they set out to do. With accessibility and inclusivity such an important aspect of the arts, it’s great to see theatre companies putting on works that not only open up discussion on issues people may be less familiar with, but also to allow those less represented to see themselves on stage. Click here for my interview with writer/director Tom Middleditch. *Original review appeared on TheatrePress on 16 September 2016.